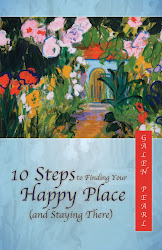 10 Steps to Finding Your Happy Place (and Staying There): Oops! Not Paying Attention! It finally happened. I use comment moderation because I get so many spam comments, mostly from “Anonymous.” Comment moderation means that I see the comments first, and I have to click on them to publish them. As you know, this results in a delay between the time that you write them and when they actually appear on the blog. I set it up this way because I wanted to allow anonymous comments from real readers, as opposed to spammers. But as it turns out, I’ve gotten only a very few legitimate anonymous comments. So I end up wading through hundreds of spam comments for nothing. Another filter option would be using the word verification. However, I find this very cumbersome, and often the letters and numbers are so hard to read that I often get it wrong when I’m trying to comment on someone else’s blog and have to go through the process more than once. Sometimes I just give up. So I don’t want to use that on my blog. Why am I telling you this? What finally happened? The other day, I was distracted while I was deleting spam comments, and I accidentally published one. And what was it about? This comment was advertising some product to enhance a certain part of male anatomy. It was very specific. Yikes! It was actually published on my blog for the brief time it took me to realize what I had done and delete it! If you saw it, you were probably very surprised. I was, too. Anyway, that woke me up and got me to thinking about comment options. I went to my Blogger settings and found four options. 1. Anyone, including anonymous, 2. Registered users, including open ID, 3. Users with Google accounts, 4. Members of blog. #4 seems prohibitively restrictive. #3 is less so, but would still exclude anyone who does not have a Google account. So I’m trying to decide if I should try #2. If I did, I think I could dispense with comment moderation so that your comments would appear immediately. The problem is I don’t really understand what #2 means. What is a registered user and what is an open ID? Can anyone enlighten me? Would that allow anyone to comment who is a real reader and not a spammer? I appreciate your patience with this post about blog logistics, and of course I appreciate any information and advice you have to offer. Galen, you don't need to publish this comment, but have you looked into Livefyre? I get very little spam - in fact hardly any at all and Livefyre catches most of it. The fellow who set up my site did put some thing in place to stop spam but Livefyre makes you set up a profile or log in with FB or Twitter which I believe foils the spammers! Oh I hear you on this, and decided to be pretty open for comments so not to drop anyone that truly wants to be a blogger friend. Blogger (SPAM) catches most of the true spammers but sometimes a few slip in and I need to delete them, but they still don't appear unless I let them. Once in a great while you may notice one that gets in against my wishes, and I'm usually pretty quick to delete them. I noticed that on the numbers and letters, I've just typed the letters and bravo it works! Good luck in your posts, I only wish/hope all types of spammers would just fade away completely. I wish I knew about all of this Galen! I guess what's working best for me at your blog presently is the option to have my site link and name - though I can understand your concern about the spam you might be getting. I wonder if you tried to have some anti-spam plugin to keep the spammers away. Open ID is something that I also don't follow as it requires you to register somewhere before commenting, so am not sure about it either. I have been debating this very same issue as I am getting more and more spam of late. I will be watching your comments. My friend told me that open ID means you have to be set up for an account (google, wordpress, etc) or give your email address to comment as an ID, and that is supposed to discourage spam because spammers won't go through that much work. But I haven't tried it myself so I will be ancious to see what others say. I agree on word verification, though it usually works, sometimes I have so much trouble I give up. Did you ever click on the audio help for word verification? It is even worse, my husband and I were doubled over in laughter because it is ridiculous. Good luck! I switched to #2, Galen, because I was getting swamped with spam by "anonymous". So far, it's working fine, and no one has said they are unable to leave a comment. Good luck, and let us know what you decide! I had a lot of problems with spam, so I went to word verification. It stopped most of the spam, but I do worry about people not wanting to comment because of it. I think you have to register somewhere else to have an Open ID and use an URL (?) --not sure. I don't know a lot about it. Down below under "Comment as:" that is one of the options--Open ID. Good luck. I'll be reading your comments, too, because I'd like to know of a solution that is open but not too open for spammers. Don't be embarrassed. Anyone who uses he internet has at one time or another been "exposed" to an unsolicited ad for some sort of male enhancement product. We can just ignore. I use word verification. It is very cumbersome. But getting all those spams is even worse. (I tried going without the word verification for a few weeks this winter, and it was really a mess.) I've been thinking of trying comment moderation as an alternative. But maybe I'll experiment with option #2 instead. In any case, thanks for bringing this up, and let us know how it goes. Galen, I think all of us understand the difficulties with spam. So if you need to do approval and/or word verification, it's not an obstacle to regular readers commenting. I've found that as my pageviews have gone up, I get a lot of spam. I also get a lot of legitimate Anonymous comments, especially about my posts relating to relationships with adult children. So I certainly don't want to limit those. I recently, for the first time ever, had trouble publishing a legitimate anonymous comment that was not spam. It just wouldn't appear on the post! And then it totally disappeared! I understand your chagrin about the X-rated spam comment that slipped by your notice briefly. I'm sure we've all seen -- and deleted -- those, too! I use Disqus for comments, and it catches almost all of the spam and junk. You might look into it. As for going with the #2 option, I think registered users means Google or Blogger users. Open ID is a service that allows for safer logging in to various sites. Number 2 isn't a bad option, and it's certainly worth a try. Personally, if I were you, I would steer clear of word verification. Google/Blogger's version of that is often very hard to decipher, and more often than not, I give up and don't even leave a comment. This is a problem for all bloggers: trying to find the right balance between allowing all sorts of comments and handling all the spam. Just in the last week I've jumped from over 50 to over 80 daily anonymous "comments" that I must delete. Blogger puts about 50% of them immediately in the spam section of comments so it isn't that tough to do a mass deletion once or twice a day. I dislike the little numbers/word step. It discourages me from leaving comments on other blogs so I'd never put it on mine. I get one legitimate anonymous comment every few days. Those folks usually leave a name at the end of the comment so I guess they haven't figured out how to use the drop down "comment as" and ignore the URL line after name. But, when I see a real name I will publish the comment. The other choices Blogger give seem too restrictive to me. OpenID is a great idea but I don't think many of my readers would be comfortable in going through the process to get one. Using a Google account no better since not everyone has one. I wish Blogger offered another option: no anonymous comments. Until they do (don't hold your breath) I will continue with my mass deletions. Despite some other problems that come and go on Wordpress, I must admit their spam-catcher "Akismet" is terrific. I don't moderate comments at all, and 99% of the spam still goes in a bucket. I can bulk-delete easily. You've worked diligently to create a popular venue. You did everything right. Like movie stars, the more popular you get, the more you'll have to expect parasites and stalkers. You're living in the most Capitalistic country there is. The fact that you have the right motives for doing this won't stop others from trying to hitch a ride. I will say that since I began ridiculing spammers directly by editing their posts, removing the links and publishing them under the "SPAM of the DAY" award, it's gone down about 30%, even though my blog continues to grow. I don't know if I'm causing this result, but it makes me feel better. You could publish a collection of male-enhancer product phrases, accompanied by photos of hot dogs, trains going into tunnels, King Kong on the Empire State building, gas pump nozzles etc. Just fantasizing. You're a mom. Imagineer something! Thanks to all for your extremely helpful observations and advice. I have just posted a follow up post to try option #2. I hope you will bear with me a little more and post a comment on the new post. If you are blocked for some reason, please email me at galenpearl@gmail.com. I agree too,we all get to learn together..